Susan has two huge Central Asian Shepherds—each weighing over 105 lbs—named Chewy and Jasmine. Also running around her house is a little 5 lbs Yorkie named, Mini. She assures us they all get along. 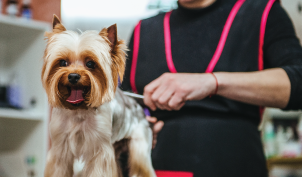 A visit to Susan’s shop is filled with the sounds of dogs indulging in the soapy suds—punctuated with happy barks and human laughter.